One of Tissot’s best 2016 releases is basically a pocket watch for your wrist, and it’s awesome. These days, most people associate Tissot with their sporty PRS line and the clever T-Touch, but the brand was actually founded in 1853 and as such have an enviable back catalogue covering off practically all the classics. This year they’ve delved into the interwar period for inspiration, and cooked up the Heritage 1936, a wallet-friendly winner with tons of wrist presence. 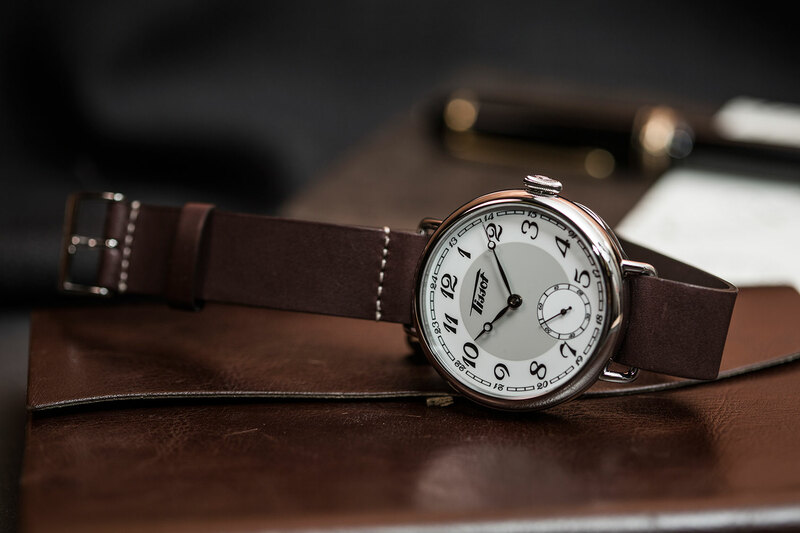 The case of the Heritage 1936 sees Tissot pulling off a very clever double act – they’ve managed to create a watch with a legitimate vintage-style case in an oh-so-modern case size of 45mm (and 12.98mm high). They’ve done this by essentially adding lugs and a strap to a pocket watch case, with spectacular results. It also touches on a really interesting moment in the history of personal timekeeping, when watches – after a few hundred years of being safely ensconced in people’s pockets, moved onto the wrist. This all changed with the First World War, when the extra seconds it took to take the watch out of your pocket could mean the difference between life and death and when checking the time in your pocket while assaulting a machine gun nest proved difficult. 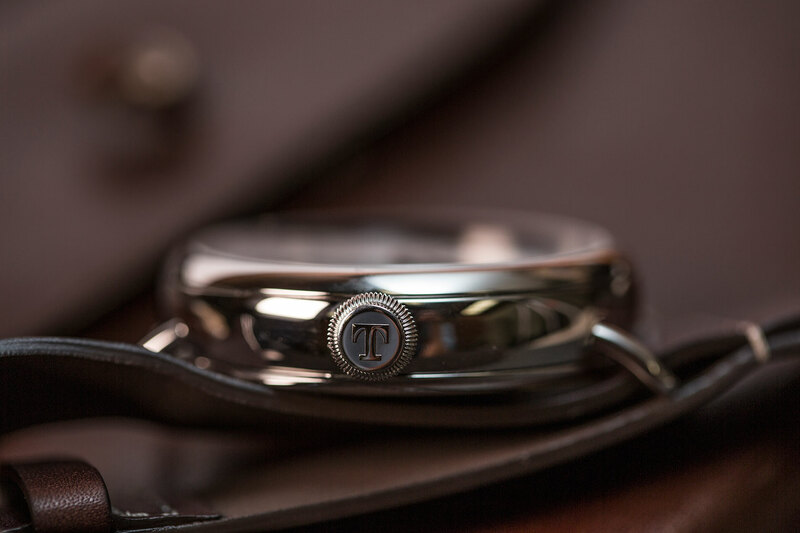 Many of the earlier wristwatch designs simple took existing pocket watchcases, and added lugs. This makes wearing the Heritage 1936 a surprisingly modern experience – it’s big and sits high on the wrist, so if you’re used to wearing watches of Panerai dimensions, this Tissot will feel right at home. The first thing I noticed about the Heritage 1936 was the wonderful combination of Breguet style hands and numerals. 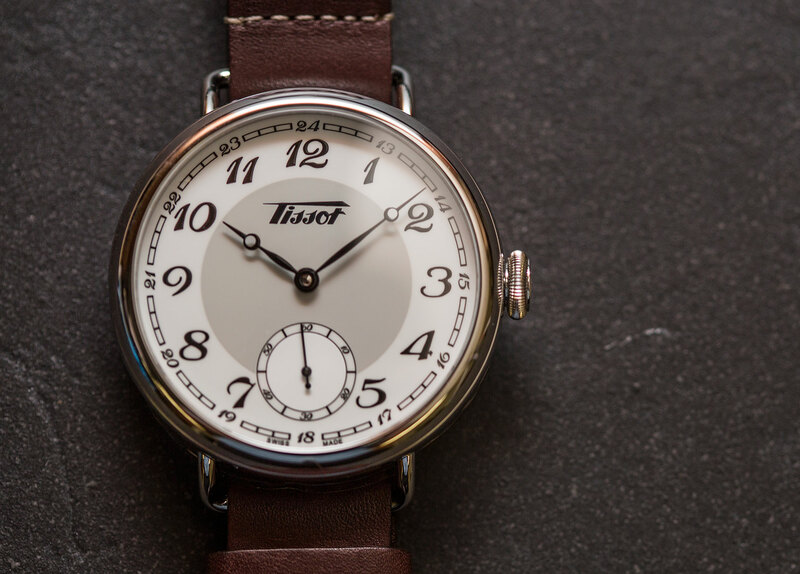 Tissot has done an excellent job of capturing the pocket watch aesthetic. The old school logo and matt grey centre section are perfect, and from a distance you’d be forgiven for thinking that the dial was porcelain instead of lacquer. The printing is quite crisp, especially given the price point. I would have loved to see blued hands instead of black, but you can’t have it all I suppose. Appropriately enough the Heritage 1936 is powered by a big manually wound movement – a nicely finished ETA 6498-1 to be precise, which is essentially a modified Unitas 6487, used in a vast range of watches. 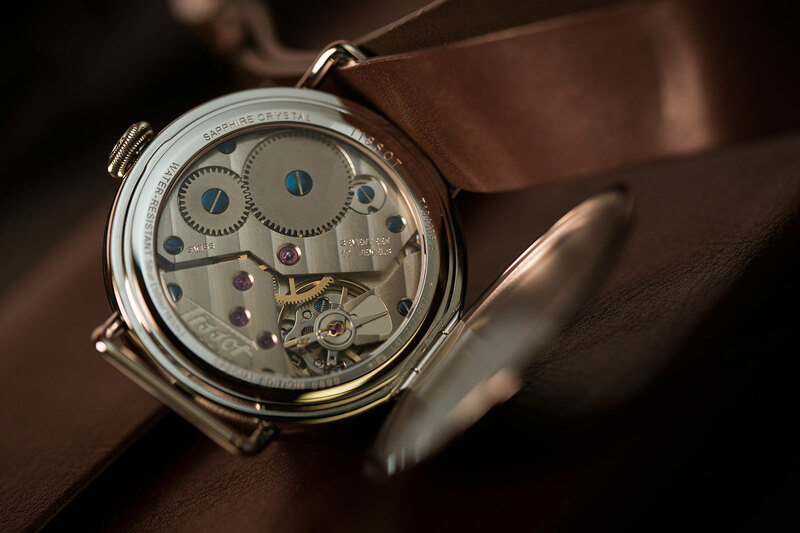 But the best thing about the movement is that it’s hidden away behind a hunter caseback, giving the watch a nice theatrical trick up the sleeve. The watch is supplied on a fairly thick NATO-style leather strap. It’s the right strap for the watch, but it lacks the grain or suppleness of higher end options. Having said that, some it might be one of those straps that get better with age. 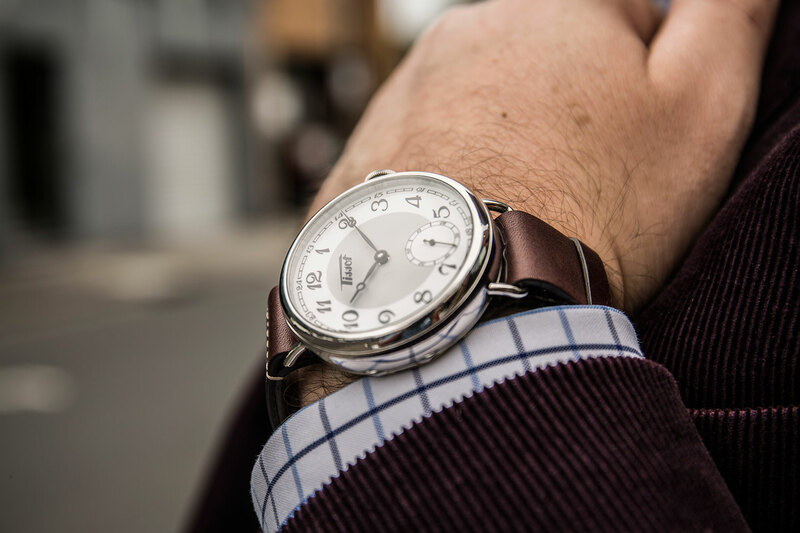 The Heritage 1936 offers you a whole lot of watch for the money. And I don’t just mean its great value – it’s also very big at 45mm. Depending on your perspective this will either be a massive pro or a major con. But if you’re in the latter camp don’t stress too much as Tissot also offer a 36mm version. Do you love vintage style, but want something with more modern dimensions? If you answered yes then this Tissot could be for you. Not a whole lot to be honest, my minor quibbles with the piece all fade away in the context of the excellent price point. But if pushed I’d like to see blued hands which would add a nice bit of extra flash to the dial. 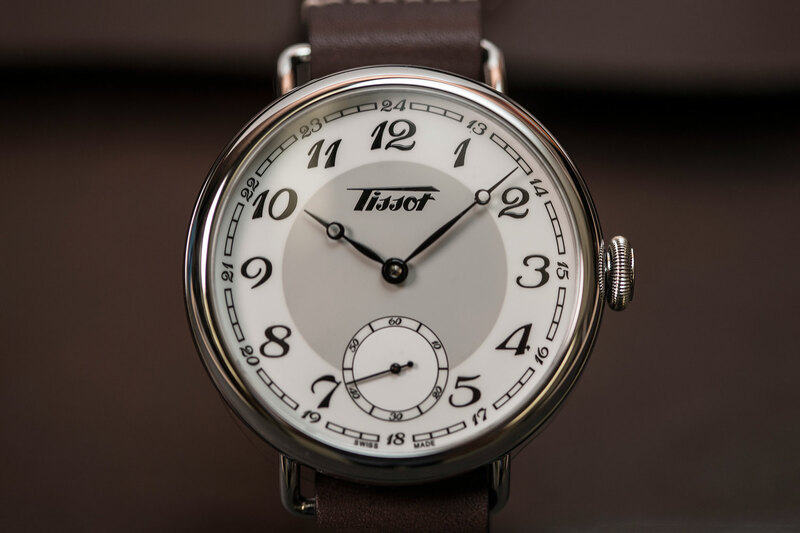 The Tissot Heritage 1936, $1350.